May 27th is Movie Night at CHEERS. We will look at many words and phrases from a great film and talk about the main characters before watching it. We start at 7.30pm on Friday. I hope you can come. Contact CHEERS for more information. by CHEERS年末特別企画 Don’t miss it!! Try extra lessons at this wonderful price!! 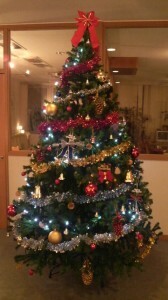 by CHEERSWe decorated the Christmas tree! This is our Chistmas tree!